i think about ikea a lot. it could be that i'm fascinated with it because it's so far away and between trips i have withdrawal. their furniture may not be the best quality but that stuff is just stylish. and i don't mind putting things together, so to get a discount because there's some assembly required, i really don't hate. a while back a did a post with an ikea desk styled two different ways, so i thought i'd repeat it with a nightstand. using the rast table,which i love for it's simplicity, i came up with a his and hers nightstand that looks great for a single or shared bedroom. 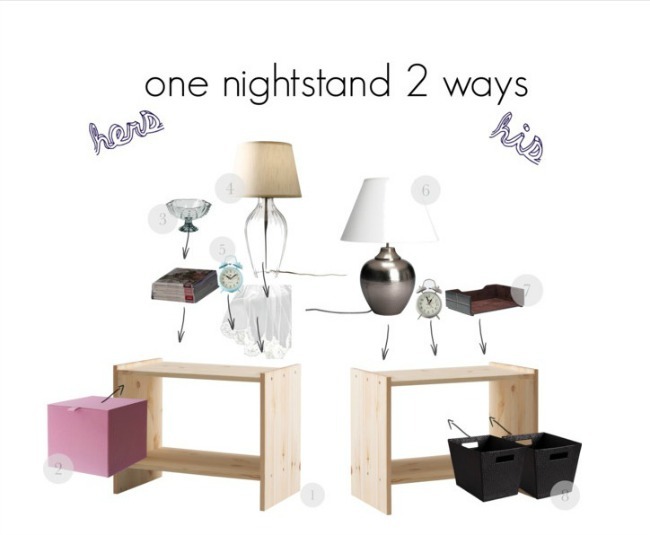 really guys, your nightstands don't have to completely match/be symmetrical. you can style them to fit your personalities and still make them look nice.